Post 'em in here in as much detail (images helpful!) as humanly/reasonably possible. Whoa weird! I haven't seen matching seed choices before. Will definitely go an hunt this one down. Were you given this choice inside one of the rooms about halfway up the biome? (We refer to these as crystal rooms) Just want to make sure I'm looking in the right place. Also, there's a chance this is a symptom of something else- could you possibly send us your player log (If you haven't already shutdown and restarted the game, that's when it resets). Wow, yeah and no null errors in there. I'm gonna try and look into this first thing tomorrow! Thanks for stickin with it. I'm having the same issue in current playthru. Oh, yup, somehow that code just got lost at some point during a refactor. My fault!! Will be fixed in the next build. Sorry!!! In the main menu (where you can press up to view the leaderboards or down to view options), pressing left or right on the controller appears to try to navigate up/down, but immediately navigates back. In other words, it seems like it's responding to any amount of "up" or "down" input, which is too sensitive and results in jittery movement when pressing left or right. I'm using an Xbox One controller. Ahhh good catch- we may not be deadzoning the menu input. Noted! Sometimes quitting to menu during a run and then starting a new one makes the seed get stuck at fixed x position and jitter back and forth, kinda like when something's stuck between overlapping colliders. Then there's a copy of the seed helicopter sprite at the seed x and the camp boundary Y. If you move through the boundary (seems to be no collision when this is happening) then things go back to normal. Sidenote: having a great time so far! Hi! I am not sure if this is a feature I have not figured out or a bug - but at two times, holes have appeared right where I am rolling. The first time a hole suddenly appeared right next to me (In the place I just had been). Second time a huge hole appeared where I was hanging out, killing me. Did not spot any animations or indications for a hole to appear there. I think this was..once in the 3rd area and once in the 2nd area. Ah cool! I really like the idea itself because when I noticed it I became much more alert, making sure to plant checkpoints more frequently. 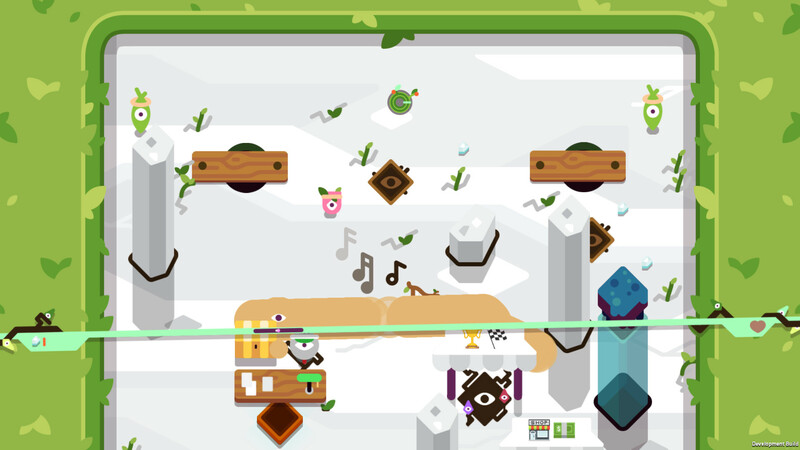 After going into a button challenge room, starting the challenge, then leaving the room before the timer expires, the challenge UI (timer and gem count) remained on the upper right corner of the play area until I quit the game. Vert Laser Seed has a planting cost of 0 crystals? Is that by design? If so, there's a small grammatical error, as it says "Costs 0 crystal to plant". Good catches on the details! It's intentionally 0 crystals -- it was previously a bow-and-arrow instead of a laser which made it a pretty weak weapon so we changed its cost to 0 to make it more enticing. I think it's definitely strong now as a laser, so we may change it back to costing 1, but either way we need to account for suits being free so that's a UI change we'll have to make. Thanks! I generally use a dvorak keyboard layout, and the game seems to hard-check for up/down arrows, w and s. With dvorak, w and s are actually o and . which doesn't work out so well. It would be great if these keys were rebindable, or if the game could detect by keyboard layout. Oh interesting! We'll have to look into solutions for that. Sorry about that! Do you have a controller you can use in the meantime? I couldn't move the stick up, but could move it down. After moving it down far enough my seed fell down, and I could resume moving up again. Unfortunately, as you can see in the screenshot, the spring was already sprung, so I was stuck. Oh no this is, like, my least favorite bug -- I've seen it once before. Super sorry. Will look into resolving it soon since I know how frustrating this one is. When I started a new game, I immediately pressed up on both control sticks (like you do). The seed got a big kick to the left. Might have been a physics glitch; I know Unity physics can occasionally be weird. Three-button bonus crates can sometimes appear off-screen below you without any indication that they've done so. I've also had one block my forward progress, without any way to break it. Nice catches -- will look into both of these. I'm guessing the crate blocked off the only way up? Crazy! Here's a really stupid tiny one: When you press A to switch seeds, the crystal indicator on the left shifts a little bit, almost like it's changing fonts or something? 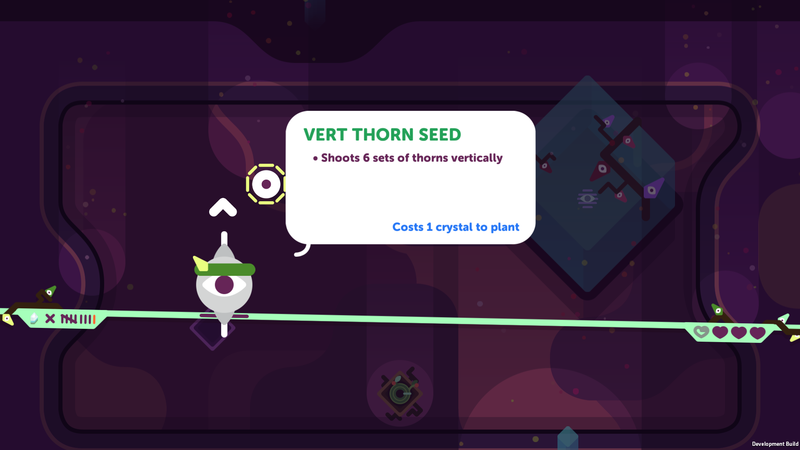 Looks like Vert Thorn Seed is using the Horizontal Thorn Seed sprite in play, but the seed selector shows it with the correct sprite. If my controller becomes disconnected the game should automatically pause. Having a ton of fun! Some bugs and thoughts. The yellow shield persists after single death. The blue shield persists after all deaths and starting an entirely new game, only cleared after restarting TS. 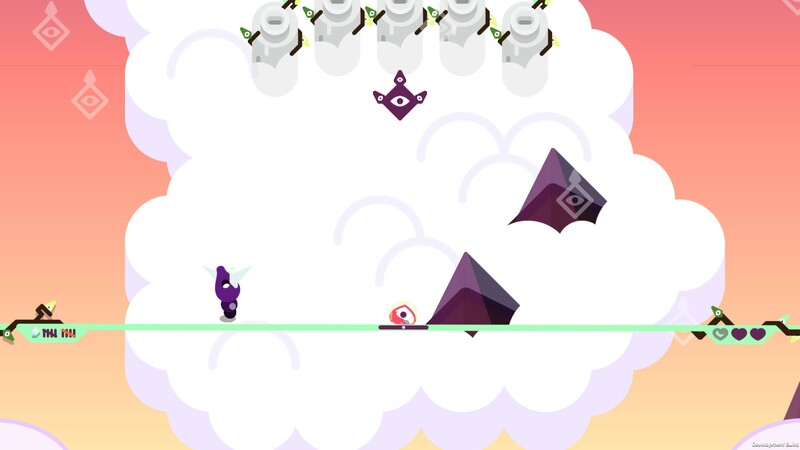 Horizontal flying, vertical shooting, hammer looking enemy spawned 2 on top of each other facing opposite directions and were stuck and flashing. Resolution size text partially hidden behind window showing graphic. Bombbud appeared as only eye and fuse in selection zone. Jungle rain is not visible most of the time, only saw it once? Love the game! It is really really good. Thank you!! Resolution size text, and shield issues will definitely be fixed in the next build. The others have been noted as well! 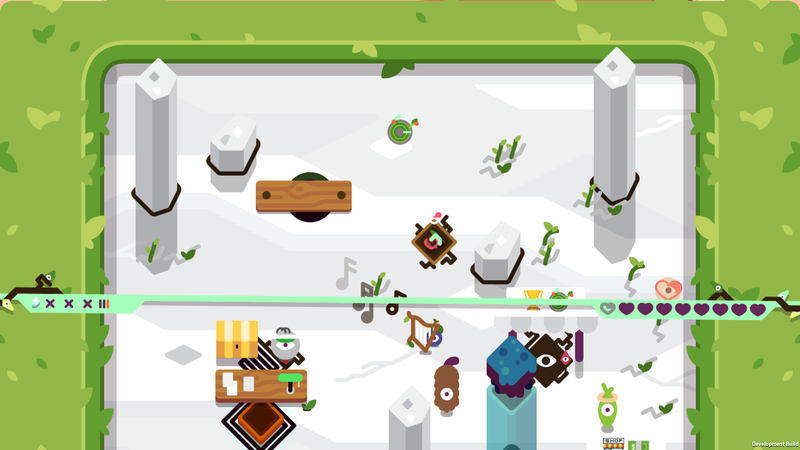 Haven't fully diagnosed this but I think there are some issues with the music system, occasionally there will just be silence (in an actual biome, not the camps) and then the next music starts up when you reach another biome. So had a hang. Not sure exactly what happened, I had just teleported up on a new run. 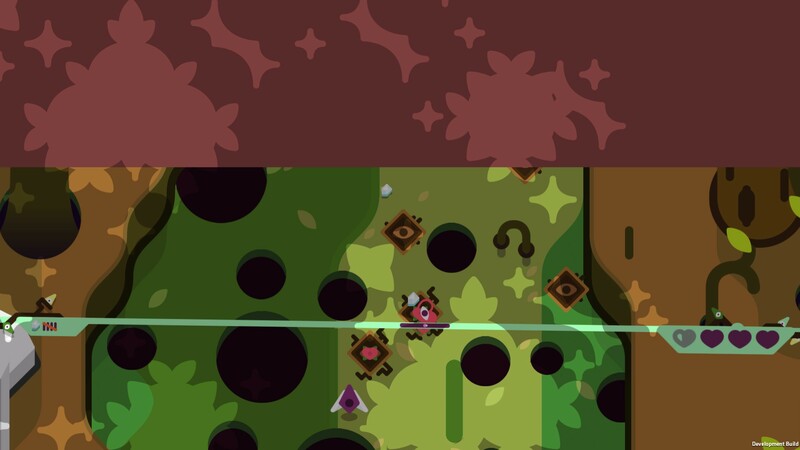 I got hurt somehow on the right most part of the orange teleport bubble trail? I don't remember seeing any enemy there. The trail started being displayed and it hung in the middle where there is the gap for like 5-10 seconds. Then it started animating again for a second until it got to the left most part where it hung for good and did not clear after maybe 2 minutes. The music/sfx was not affected. Those 2 error were repeated many many times. Sending full log in email. I have a hunch on this. Right now teleport orbs aren't being cleared properly when you restart the game, so it looks like it's looking for some object in the world that belonged to the *previous* world in which the orphaned teleport orb belonged. Will dig into the log in the e-mail. Any bugs that cause crashes are super high priority so thank you!! Not sure if it helps, but I had an orange teleport bubble with me and had just started a run having just teleported up to that camp. There were certainly other orphaned orange bubbles strewn about though. Not sure how I got hurt there, I guess if it had to do with dangling references or something all bets are off. I returned to a hole, the kind where you get to choose between 2 classes, after passing it so far that it went under the bottom of the screen. 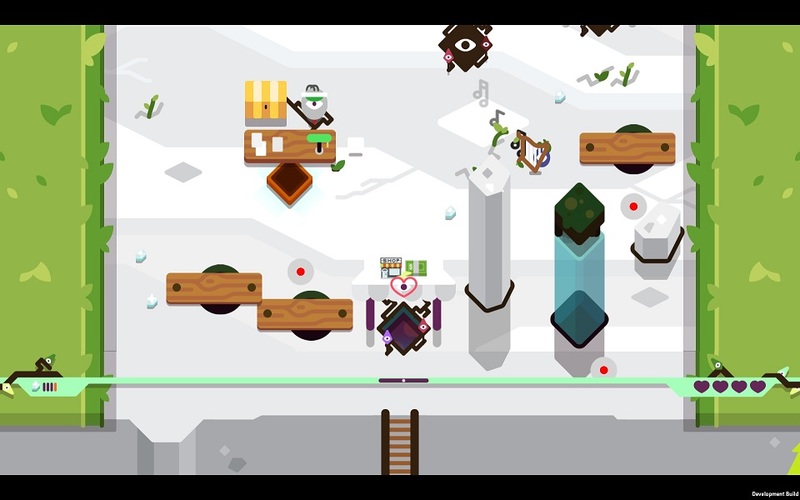 When the screen changed to what's in the hole, the camera was still centered on the player, instead of above the player, resulting in the class descriptions appearing above the top of the screen. One of those tiny green flies from the first region followed me into the town between Region 1 and 2. I thought I could keep an eye on it, but I apparently lost track. Due to the light color of the body and the white wings, it pretty much disappeared against the white floor background. Of course, I ran into it. Just seemed a bit unfair. Good catches on these. The flies are definitely not supposed to enter camps, and definitely looking into mineral spawning problems. Thanks!! Quitting the game during a "You fell into a hole, now watch your progress reset"-cutscene causes the red screenflash when starting a new game and causes some unexpected behavior. Just repro'd this. Great catch!! That's a nasty one. Won't get the fix into this next build coming hopefully today, but will definitely look into it for the next one! I had a spring plot spawn in such a way that it would catapult you into a wall. 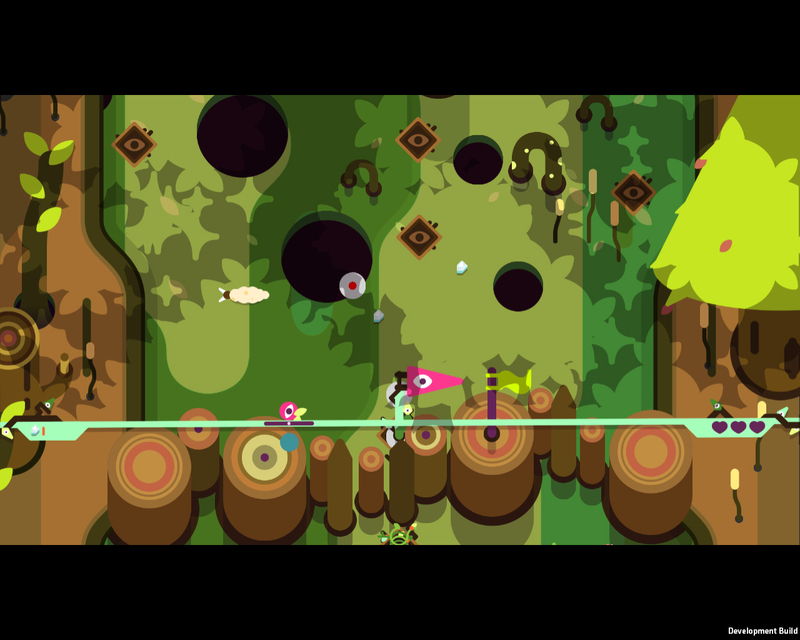 Granted, one could steer away from the wall while flying up but then one would quickly find oneself above a nearby hole. This is sort of intentional that the placement of certain plants affects their usefulness and your decision on whether to use it or not. Does it feel unfair? No, it just felt a bit awkward being catapulted into a wall. That crystal looks like it might be from a previous run and was never destroyed. I wonder if crystals just have a z sorting issue as well. I know we recently optimized some z ordering logic and ive seen this side effect before with crystals. We'll look into it! I managed to double die. I had 1 heart and took a projectile hit while I was falling into a hole, and both death animations and sounds played at the same time--the tumbling down and the falling over and dying. No need to rub it in, TS! On the new Alpha build that dropped really recently. I got to past the first area and went onto the jumppad. But my vine didn't follow and my sticks would only register down and not up. My little seed was shaking furiously as I couldn't help but move further and further away from him. 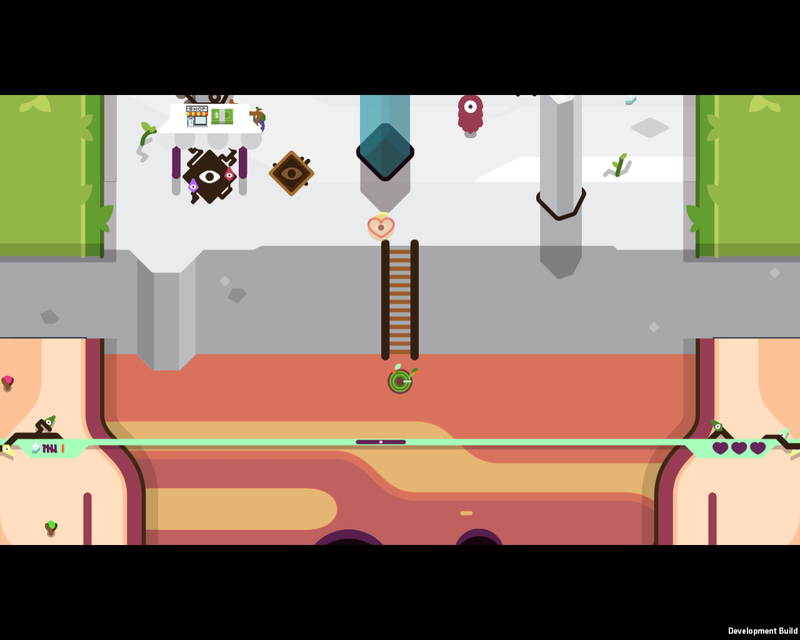 Eventually, my seed dropped down to the previous level (where my vine was stuck, and I regained the ability to go upwards once the seed landed on my vine again. Happened at the top of the desert this time. Thank you for the screenshot!! I actually have a hunch now what this might be!! Often when I go into a shop, I can't read the text bubbles unless I navigate between the purple buttons. Was carrying the blue teleporter thing up to the blue area. Was also doing the "finish the forest in under two minutes" quest. When I finished the quest, the blue teleporter indicator was gone. When I got to the blue area, nothing happened. 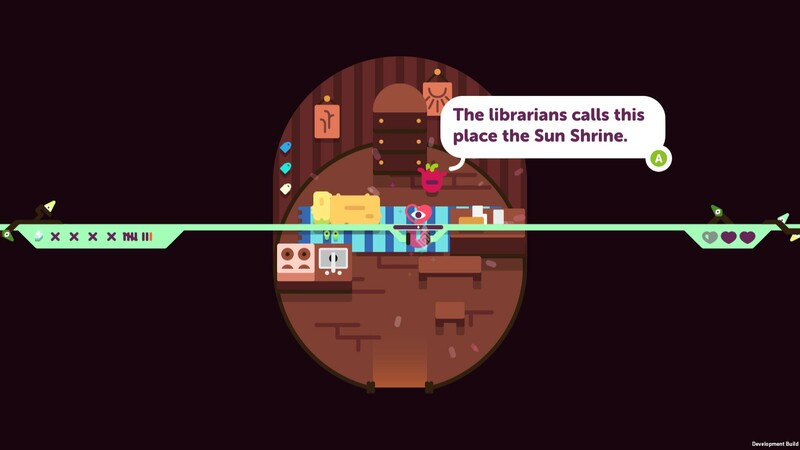 Yeah the teleporter orbs are Peak Programmer Art right now haha sorry! Don't know if this always happens or, if not, how to repo. Rotating laser turrets ignore cloak. The explosion throwing turrets ignore cloak too. Bit of a soft lock here: I fell into a hole in Desert and the letterbox came up and I could hear the sound of respawning at the bottom of the biome but the camera didn't follow. 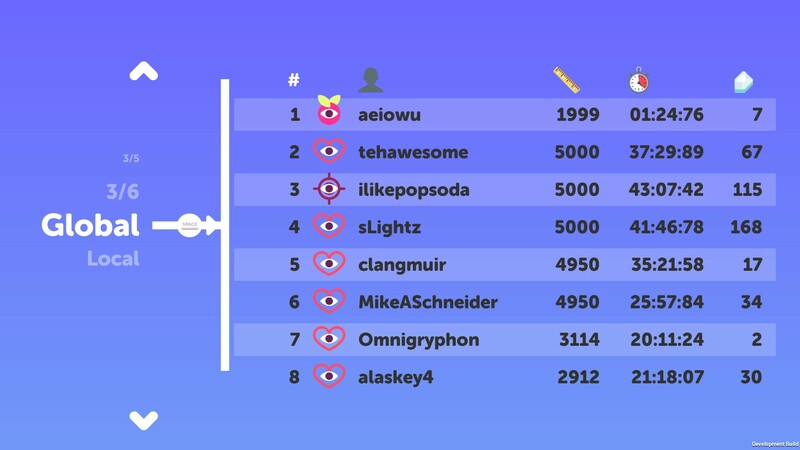 Was shaping up to be a pretty good run, too! Ah, well. Forgot to grab a log but if I see this again I'll make sure to post it. There was a grub on top of a plot. I planted a thorn seed on the plot, the grub wasn't killed, and I didn't get a thorn. 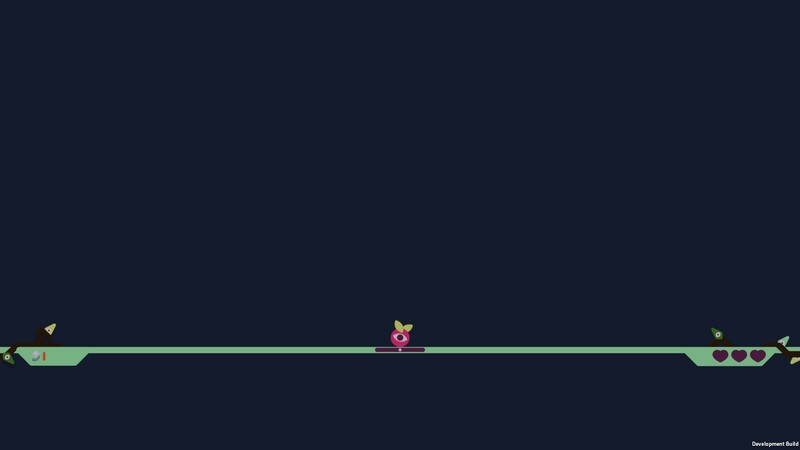 One of the red torpedo shaped enemies that dig new holes leapt up in the air, and then came down on a spring plant that existed above it, triggering the plant and the torpedo-thing glitched out simultaneously trying to fall like normal AND be propelled up by the plant. I also got a surprise plot that was hiding behind a log (perspective was hiding it). Luckily, I think I planted something like a crystal seed or a heart, but if I was another class that could have ended poorly. I'm surprised that this hasn't come up in this thread: The Mace Seed is pretty broken. 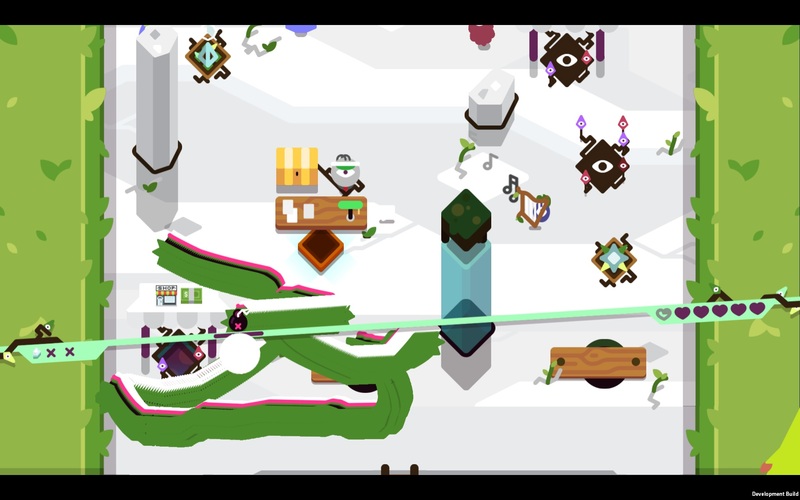 The mace disappears on contact with none enemies (like walls). I think it disappeared when a thorn took out an enemy. I've had it disappear when standing still, and nothing is around me. I have had the exact same experience, just haven't put in a report yet. 0.0 wuuuut hahaha that's bizarre. I'll try to repro here. Quad Laser seems to be broken...or I don't know how to use it. I've planted a couple now that charge up, don't fire, and even when I run over them again, nothing happens. It makes a sound like something happened and then charges again. They were broken in alpha 0.4a but should've been fixed in 0.45a. Are you playing on the latest? I'm on the latest version. The next time it pops up, I'll try it again. I don't know what this is, but it's freakin' me out. Homing Seed doesn't lock onto purple-should-be-pink flying mobs that follow you. Thankfully, it doesn't seem to lock onto you instead, but it fires off at an other enemy, even one that is not on screen. Is homing seed supposed to be able to be reused? If so, when you run over it, it has an animation, but nothing happens (no time depleting status bar, no 2nd homing shot, etc). Not supposed to be able to be reused -- that's a weird bug with how the general planting system is implemented. Noted, though! 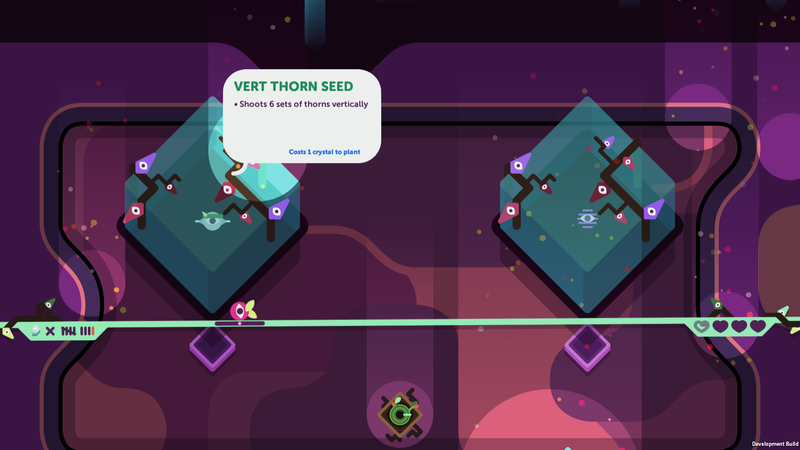 Homing seed's description doesn't mention the purple shrapnel. I think it should. Planted Flytrap didn't activate when a pink spider landed on it. I was the Gardener Seed and planted next to a Crystal Room entrance. The entrance was filled with a plot. "Whatevs" I say to myself just before I plant on it, resulting in me re-entering the Crystal Room since it was still being treated as a door, by the game...I also seem to have lost the crystals that spawned from said plant, but that's beside the point. I ran into the "balance beam not responding to up input after entering the town" bug, and I was able to repeat it. Both times I was flush against the white wall above the launch pad. I'm guessing that whatever bit of code that is preventing the beam from raising while hitting a ceiling is still in effect after hitting the pad. Funny enough, this bug persisted into the next run, after I exited to main menu and hit space to start a new one. Oh INTERESTING. So you, like, approached the spring from the top? 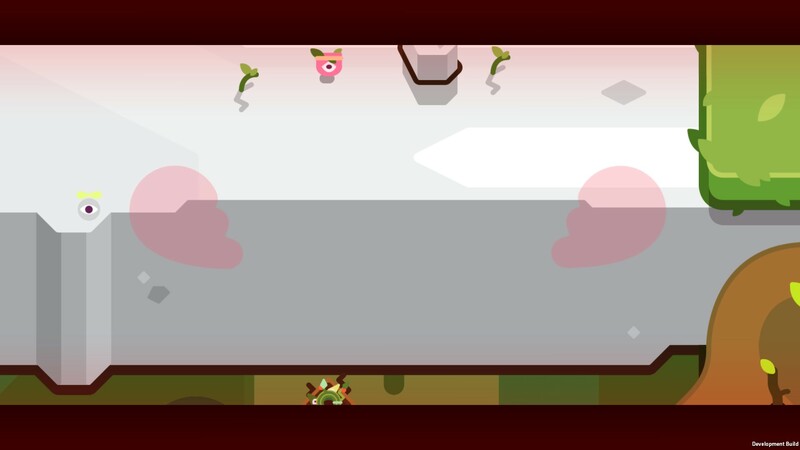 The level is hidden when you have a ton of hearts and you roll over to the right side. Turns out I rely on that thing a lot and stumble around a bunch when I can't see it. Here are some notes from my first two sessions. I haven't made it super far in the game yet, as I'm still getting used to the control scheme, so if any of my suggestions/criticisms/bugs are misguided, let me know. Everything is marked with game versions because I played yesterday with 0.45 and today with 0.5. I'll be up front and say that I didn't read though all of the bugs in the thread, so if there are repeats, sorry about that! This game is a lot of fun so far. 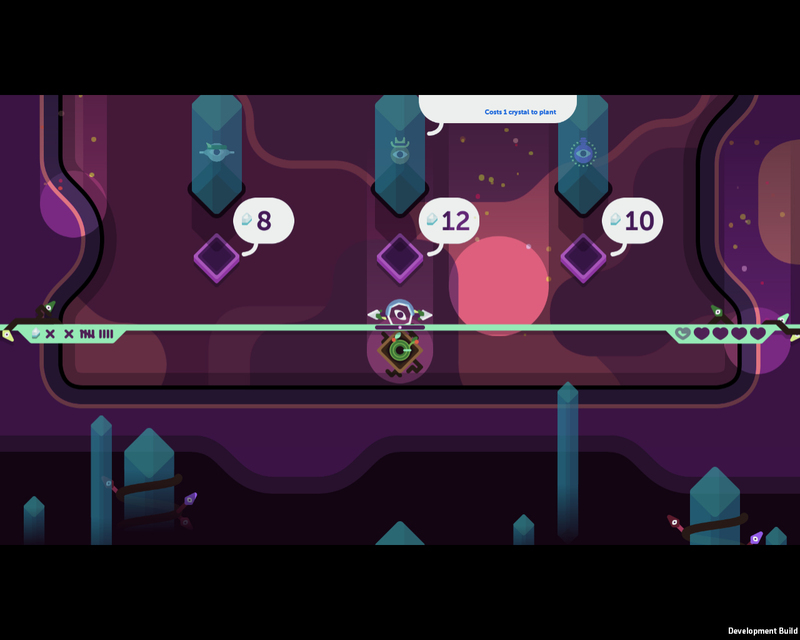 Of course there's that initial "arg, this is pretty difficult and has a non-traditional control scheme", but once you get over that it's very rewarding to feel yourself get better at controlling your movement, understanding how to navigate the stages, and interact with different seeds. "Crystal Room" sounds like a room where you'd spend crystals, the fact that the crystal rooms are free seeds and the "Shop" is the room where you spend crystals seems a little confusing, I might just be missing something though. How in the world does a seed roll over water? 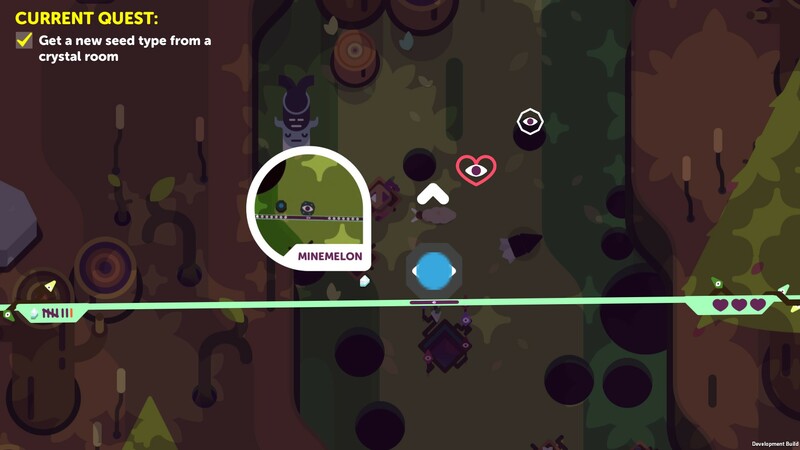 (0.45) The color of the speech bubble for the folks in the post-forest camp (maybe all camps?) blends in with the color of the background (both white), could use some contrast. In a similar vein, the "I can talk to this guy" indicator tends to blend in at the bank as well. (0.45) (1920x1080) Icons in the menu seem like they need to be higher resolution or vectorized. (0.45) Quitting the game from the main menu: For some reason my instincts always tell me to look for a "quit" option in the menu available from the bottom screen (the one that has the "resolution" and "fullscreen" options at the moment. I realize you can just hit circle/escape in the initial screen to exit, but having it also available in the options menu might make sense as well, just a personal preference/QoL addition really. (0.45) I picked up a seed from a crate that showed up after hitting three purple buttons. When I picked up this seed (homing seed, doubt that matters), it was automatically equipped but I had to open up the seed menu to find out what kind of seed it was. It would be nice if there were an alert on the screen that said "Homing Seed" or something like that so I knew what I picked up without having to go check. (0.5) After hitting A or X to access the seed selection menu, it would be nice to be able to naturally exit it without selecting a new seed (B or Circle). (0.5) I found myself wanting the "back to checkpoint" animation to be faster, I feel like it takes me out of the flow of the game by creating downtime. (0.5) Similarly, the time it takes to begin a new run after losing feels a little long also. (0.5) I don't know quite how I feel about newly obtained seeds being equipped automatically. I feel like generally if you've got a strategy going, a new seed isn't usually going to be used immediately most of the time. (0.5) The default seed seems like it should be the crystal seed rather than the checkpoint seed, seeing as it's the only one (that I've seen) that doesn't cost any crystals to plant and using the checkpoint on the first few plots is pretty much worthless, even for a super beginner player. In fact, any of the seeds other than the checkpoint seed seem to be more useful at the very beginning. (0.45) Maybe fade/cut the audio when you open the menu during the game; it gives more of a feeling of things being paused. Again this is definitely personal preference but I think audio continuity (or in this case, discontinuity) helps with the flow of the game. (0.5) I had a bug in the second biome where as soon as one of those horizontal full screen lasers was off the screen, to the bottom, the audio for the laser charging kept repeating itself until I went back down. (0.45) Slow seed: The animation after planting, when the slow effect is activated, is too abrasive in my opinion. It completely obscures your view of the entire screen for the duration of the animation. Perhaps this is for balancing, but I find it annoying more than anything. (0.45) (screenshot 1, screenshot 2) Crystal seed: I used the crystal seed on a plot near the side of the side of the map; I watch it spawn 3 total crystals (I picked up one before I took the screenshot), but one of them is inaccessible beyond the right side of the map, this seems unfair if it's intentional. (0.5) Teleseed: The terminology "telefragging" has the potential to confuse and/or go over the head of someone who doesn't know what it is. More precise language might be helpful. I picked up a seed from a crate that showed up after hitting three purple buttons. When I picked up this seed (homing seed, doubt that matters), it was automatically equipped but I had to open up the seed menu to find out what kind of seed it was. It would be nice if there were an alert on the screen that said "Homing Seed" or something like that so I knew what I picked up without having to go check. Good idea! Seeds from crates are pretty rare so I always forget that's a place where seeds appear, so good catch! The default seed seems like it should be the crystal seed rather than the checkpoint seed, seeing as it's the only one (that I've seen) that doesn't cost any crystals to plant and using the checkpoint on the first few plots is pretty much worthless, even for a super beginner player. In fact, any of the seeds other than the checkpoint seed seem to be more useful at the very beginning. Yeah, this is something I struggle with. 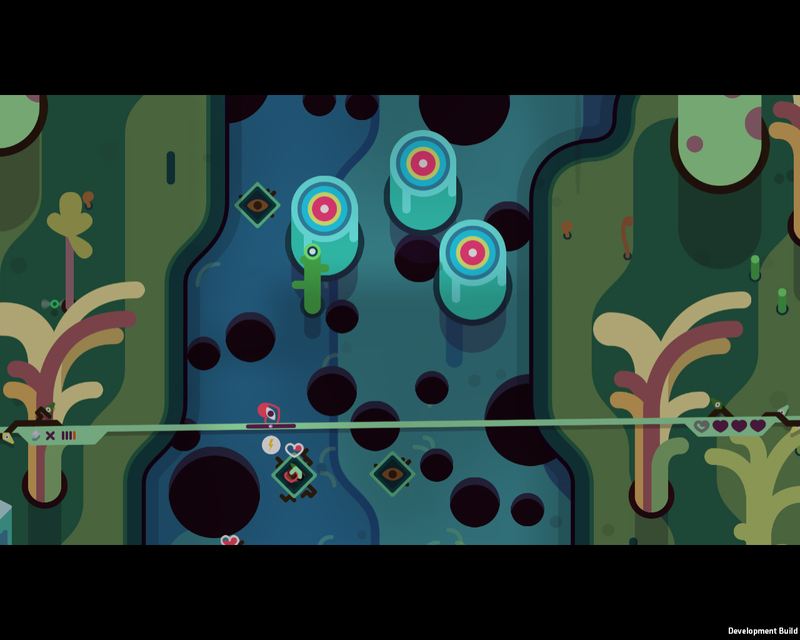 To us, the checkpoint seed sort of *is* the character of the TumbleSeed. So it's sort of that in his default state TS plants checkpoints. Haven't talked about this much with other people on the dev team, but it's something I've been mulling over personally. Thank you for such detailed and precise notes, it is truly appreciated!! A lot of things you noted are already on our to-do, but it's always good to hear those issues again as they bump them to the top of our minds. Specifically with world generation stuff David just wrote some code the last couple weeks that should make world generation way way faster, we just have to integrate it. Again -- great notes, thanks!! Yeah, I can totally understand that commitment to the character. Its actually a very interesting conversation to be having and I'd like to hear what other people have to say as well. 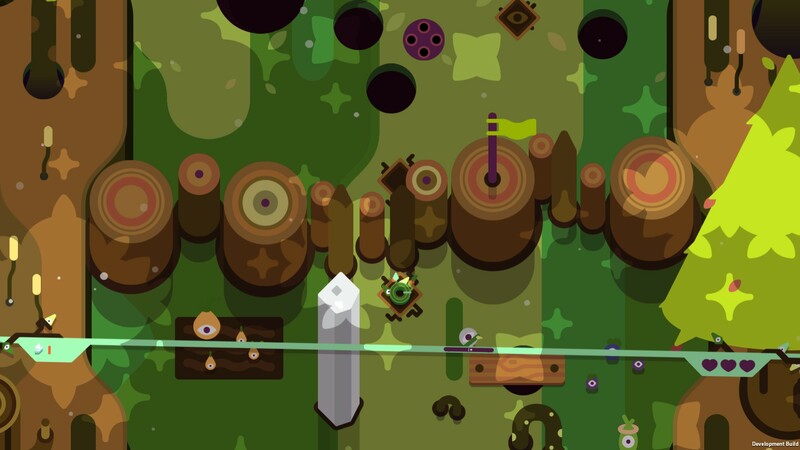 I think a big argument for changing the default is to appease the nature of roguelikes. 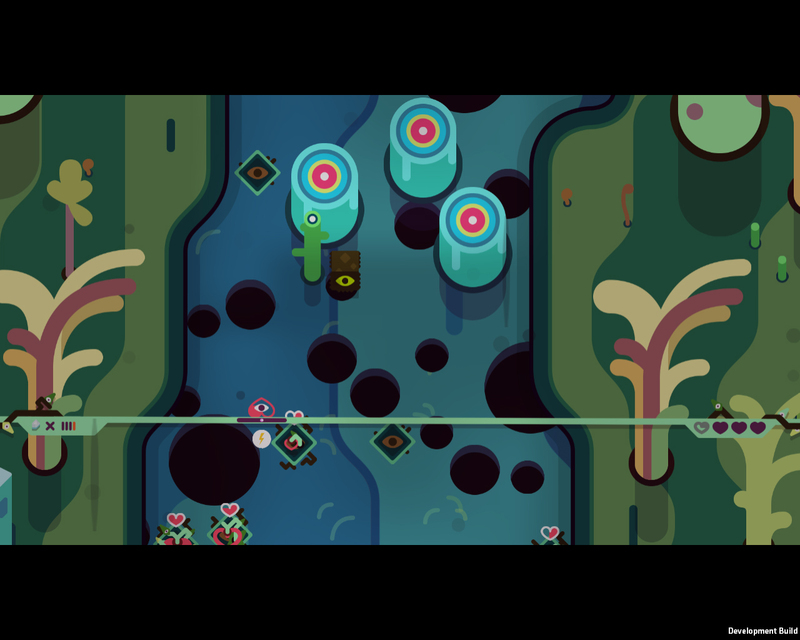 By making the default seed the checkpoint seed you're establishing a meta where the beginning of every run begins exactly the same: the player has to switch to a different seed than the one equipped. That sort of goes against the idea of varied gameplay, in a way. Definitely not rambling, thanks for all the insight. I would say a portion of my suggestion definitely comes from my lack of experience with the game, so I guess I need to play some more! Had a couple people over playing last night and they liked it a lot. 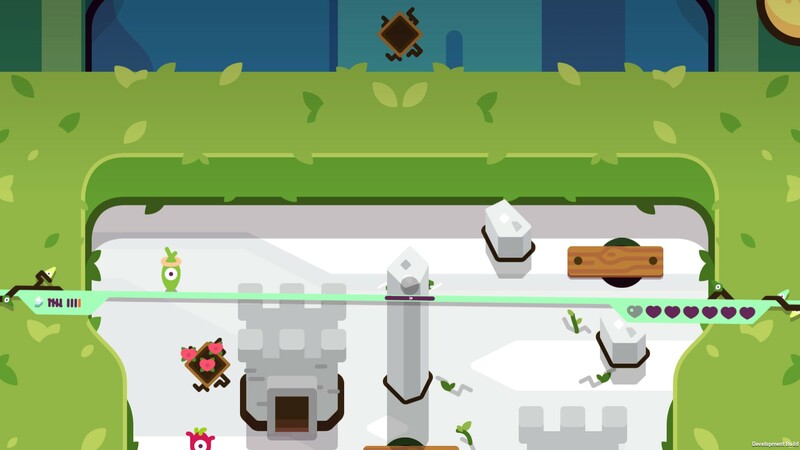 Not sure if this was mentioned somewhere, but we found if you quit on purpose to restart a run, you keep thorns and other items like that from the last run. We also had the seed spawn at the location of the quit rather than the beginning although that didn't happen when I tried it again with 0.5 just now but the thorns did. We could move the bar up to meet it past the gate as well if that help diagnose. The spike sound effect plays even if it is off screen which can be confusing. It also plays on the title screen if you quit out of a game while they are in sound range. Had the seeds in a seed cave appear "on top" of the crystals [pictured below]. Then, when I took one, the other didn't disappear. I just got insta-killed by a vertical-moving grub. I think it's because it was moving up and I was up against a log (as in, underneath the log). Maybe, since I wasn't able to pop up into flight, it just hit me for all my 3 hearts in the same instant. That's my best guess.....This happened pretty much in the first screen. 1. I slipped into a shop and the graphics glitch followed me, exactly as it appeared in the picture. As in, it didn't refresh or start over, but remained exactly as it looked in town. Difference was that a bomb started charging and exploded. I guess the bombs are prevented from spawning in town, but the shop isn't considered "in town" by the aura. 2. When I left the town, things started behaving as expected. I would recommend not having the countdown start until you have left town. Don't want to be planting a bomb just as you enter a new region. Claymore Aura had one definite bug and one potential bug. 1. The mines were still there the next time I came back to the forest town. 2. Do you want auras to plant mines/bombs in town? The Claymore Aura started that up, immediately, without waiting to get out of town. Also, I got hurt when I came in contact with the spring pad, exiting that town. Maybe there was a claymore under it? It let me through the second time. I just picked up the Re-Roll Aura, but it doesn't tell me how to "spend" it. I went into a shop, hoping to find something to help me undersand, but I still have no idea how it's done. I don't think homing aura is working properly. I aimed and shot a pistol right at a pink spider and the shot was green and curved around the spider and hit nothing. Just ran into this bug a second time: Grub is on a plot. I squeeze my way into it, planting a Thorn Seed, but I don't recieve a thorn. This time, the thorn definitely wouldn't have spawned on top of the grub since the grub was on my right side. 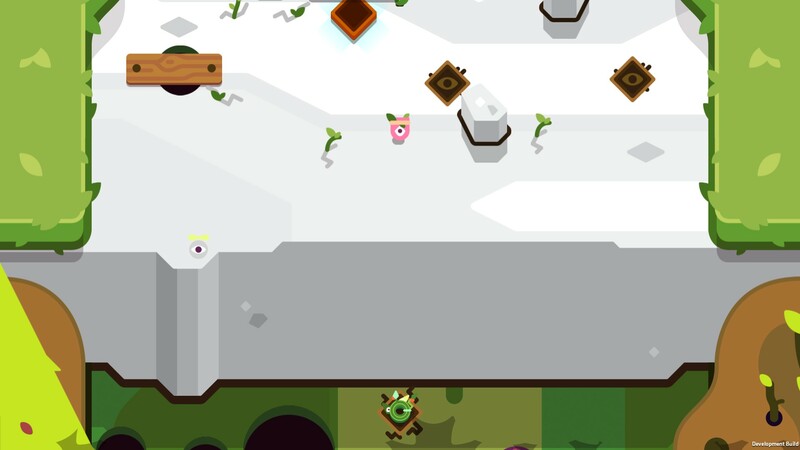 Warpseed is broken in the boss fight, which is a real bummer because it probably cost me winning the game. 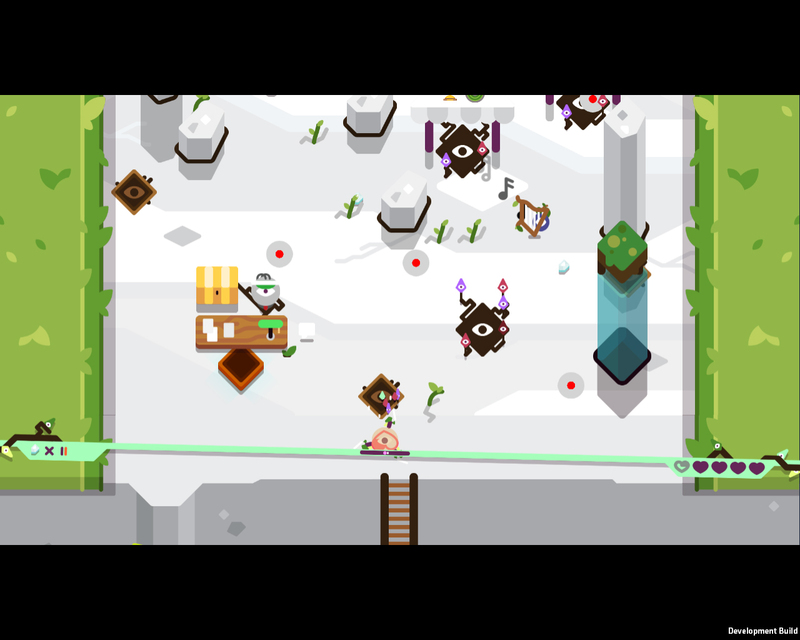 Thwomps sometimes disappear from the screen, only to reappear later. I'm not sure what causes this behaviour, but they don't seem to be invisible, they seem to temporarily cease to exist. No idea why, but it does happen with some amount of regularity. When you digseed a used seedplot, and then try to use star on that new seedplot, it plants cloak instead of star. awesome, i've been wondering what that was about, it happens to me as well. thanks for the details/sleuthing on this! sounds like it could be a bit of a bug. or maybe it seeks out the wrong enemy from the player's perspective? Today, there were 2 instances that I used Red Hot Rock, got hit while I had it active, and then it wouldn't reactivate even though the meter was still there. Is RHR supposed to go away if you're hurt? - In camps on a couple plays I have encountered enemies. Encountered both a fly and one of those vertical moving things that shoots horizontally. -The orb that you carry up the mountain is exactly the same color as one of the mountain strips, so I took damage and it dropped and blended into the ground. Also the crystal seed blends into camp 2 super easily. -The totally flat colored orb icon when you're carrying an orb. -The various recharging bars. If they just had rounded edges and maybe a simple trim I think that'd be more than enough for me. 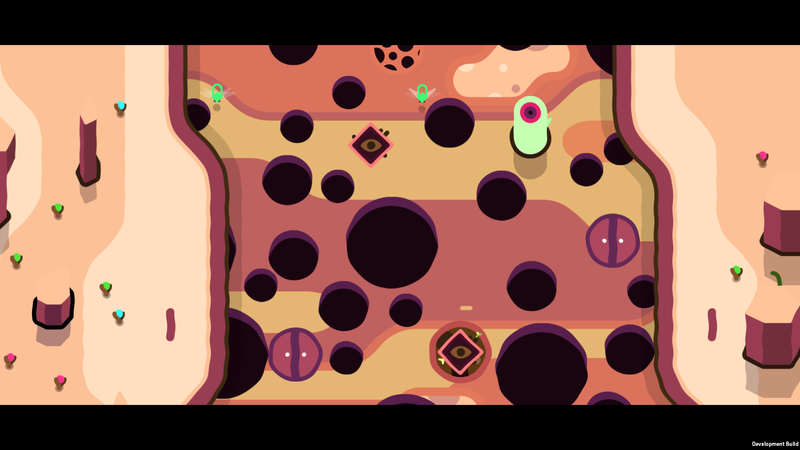 -The gopher like creatures in zone one that just sit there feel a touch out of style from everything else. Not bad, just a bit too much like animals, whereas everything else feels pretty cohesive. I've played over 4 hours, and I've grown to really enjoy it as an escape, even though I still hit hard gameplay walls. Gotten halfway through the desert. awesome! thanks randy :) we'll look into the camps more closely for sure. yea all the auras are temp as is the other stuff you mentioned, actually working on auras right now haha. 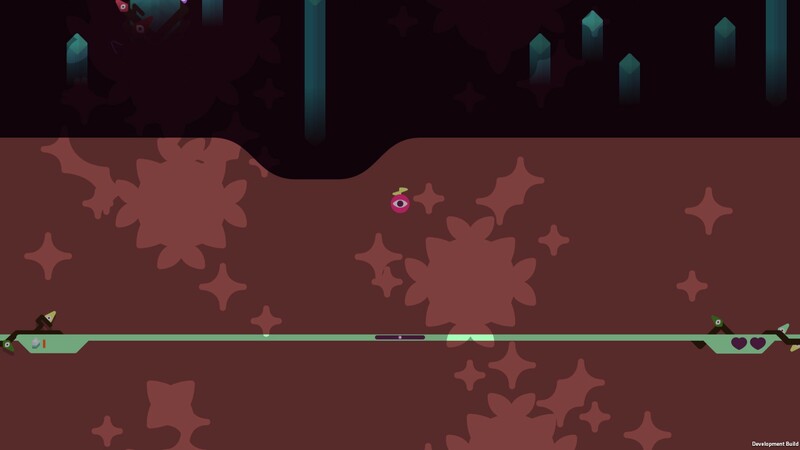 they'll sorta look like this: https://cl.ly/101s2o2n3a1S with the gem attached to the vine and a familiar that is attracted to that gem. like little spirit friends that follow and help you. Ah cool, I dig it! for sure, you don't have to pick a seed to try it. that's probably unclear. you can just go to the test spot above the crystal and it'll test that. i think what will end up doing is just not removing the possibility to test seeds even after you pick it up. if that makes sense? i think this might be due to homing tracking to the wrong origin on certain enemies. was it the purple LOS shooting guy in the jungle maybe? ah yea, that'd be another one with problematic origin/parenting stuff going on. ok cool, put it on the list, should be able to trakc this down no prob! haha! yea f'real. doesn't belong here! oh awesome, thanks so much mike! Yikes! I'll be sure to get this fix in and I'm gonna try to push new builds today. Weird! So let me clarify: You hit the spring, and it launched the seed up but also triggered a fall sequence? Did the screen fade and load the camp first and then you saw this? Or whats the context/leadup to this? Just pushed this fix to our repo :) whenever our next update goes live it should be gone! cool yea this is on the list as well. it just never gets reenabled it seems. thanks mike! ahh good catch. i just made it so you can't "restart" from the menu in the daily as well (I think it just makes it a normal "adventure" play if you do, but yeah that shouldn't happen). I'll take care of this now! - This seems like a bug: I had a quad laser planted and there was a big spider that was triggering it in mid-jump. Seems like it should only trigger when it's on the ground. great, thanks for the screenshot gerry! will be a big help. haven't seen that one before but i have a hunch. for the spider: that's a bit of a known ongoing struggle. it's on the list and adding it again per your report. thanks again! 1) Good call on the menu sound sticking around. I think there are a fair amount of lingering sounds that happen if you quit mid game.